This book summarizes the achievements as well as some of the challenges faced while implementing integrated systems research to support the sustainable development of smallholder farming in the uplands of the Mekong region. 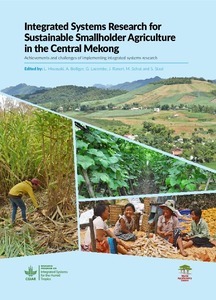 It describes how CGIAR centers and national and local partners collaborated to test options to increase farm productivity in the Central Highlands of Vietnam, and how field trials in Xishuangbanna, China; Son La, Vietnam; and, Luang Prabang, Laos, showed that agroforestry and home-based vegetable gardens, among other interventions, could contribute to reduced land degradation and erosion. Efforts were also made to address the marginalization of ethnic minority farmers from agricultural and rural development. involved. Also, implementing multistakeholder processes such as establishing and working together through multistakeholder platforms, was challenging and not always easy. However, some interesting new partnerships have emerged from this experience. This book was developed under the CGIAR Research Program on Integrated Systems of the Humid Tropics (Humidtropics) which aimed for sustainable intensification of agricultural systems to improve the livelihoods of farm households.Its Central Mekong Action Area was primarily focused on the complex of rice and non-rice farming systems (plus areas with other land uses) in the non-flood-prone lowlands, uplands and highlands. The Action Area covered six countries (Cambodia, China, Laos, Myanmar, Thailand and Viet Nam). Hiwasaki, L., Bolliger, A., Lacombe, G., Raneri, J., Schut, M. and Staal, S.J. 2016. Integrated Systems Research for Sustainable Smallholder Agriculture in the Central Mekong: Achievements and challenges of implementing integrated systems research. Hanoi, Vietnam: World Agroforestry Centre (ICRAF) Southeast Asia Regional Program.